I have a confession to make: I am afraid of white aprons. It's not like I fear them jumping out from around corners or anything, it's just that whenever I get one, I am afraid to use it because I don't want to mess it up. I know that this does, in fact, defeat the purpose of having the apron at all... and so when my friend gifted me this totally awesome white apron for my birthday, I was forced to confront my white apron fears once and for all!! Since this was a gift and the apron was awesomely cool, I vowed to actually cook in it and not pass up the opportunity to don the beauty. It's not like I am going to go canning a bizillion tomatoes in it or anything, but I am going to use it. Maybe for making chicken. I think it could survive grease splatters. The thing is, this apron is like every white shirt I have in my drawer that never gets worn because I am afraid to mess it up due to my incessant cooking... and I need to get over myself. These things are material. Replaceable. And completely nonexistent if you don't use them for their intended purposes. Like, if I had a friend who said she had wedding china that she never used because she didn't want to mess it up, I would say, "well what's the point of having it at all?" Some things we just shouldn't worry about. 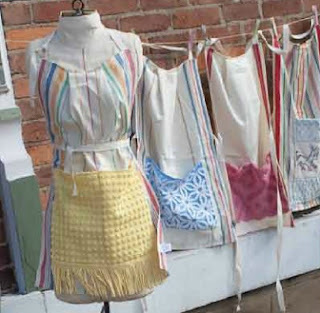 Since I have obviously gone to the point in this conversation where I have given so much over-thought to the subject of white aprons, I feel like I need to reach a resolution once and for all. I will fear not the white apron. I will embrace it. I will love it. I WILL COOK IN IT! And on a nondescript Wednesday, that was just what I did: I cooked Carbonara in it and it was fantastic. Most surprisingly, my white apron did not spontaneously combust. So I think I will actually use it again!!! So what about all of you out there in the abyss we know as cyber space? What do you fear? Is it a kitchen gadget... an apron... your grandma's china?? Share in the comments section below and tell me how you are gonna change your fearin' ways!!! Whole chickens. They used to have a Perdue commercial where the mom had “roaster-phobia” and I have it too. I think it’s because in my head I think it’s going to take a long time to cook and also I don’t know how to carve a whole chicken, so I have never tried one. Also? I don’t own one single apron. I don’t know why. I really (really!) should because I walk in the door from work and go directly into the kitchen and start cooking – usually with a glass or two of wine, it’s my “me time” – and I do in fact have a ton of messed up clothes. I love it!!! I think you can overcome roaster phobia, just like I overcame my white apron phobia... one step at a time!!! !